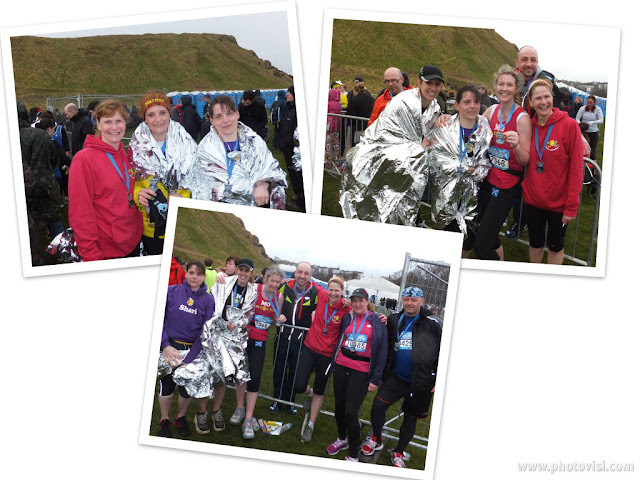 On Sunday the 15th April 2013 I ran the Edinburgh Rock N Roll Half Marathon! Not one of my best finishing times for a Half Marathon, but probably one of my proudest moments. This was one race I was really looking forward to, but thought after my injury I had no chance of running BUT amazingly ... I DID IT! My Husband and I decided to go up to Edinburgh a couple of days before the race to have a mini break and do the touristy type things! We arrived by train in Edinburgh on Friday 12th April at around 1.30pm and got a taxi to the hotel. I had a little giggle to myself when I realised we had been allocated a disabled room - were the hotel aware of my ankle issues?! Once checked in we headed straight back out to suss out where the race started from and to work out how much time we needed to get there come race morning. With the aid of google maps and my i phone we found our way fairly easily and it was only a 20 minute walk. A nice little pre-race warm up on the day! When we arrived at Holyrood Park the "start line village" was just starting to be set up! A shiver of excitement (and from the cold!) ran through me as we watched the men at work! It was in a beautiful setting with glorious views of Arthurs Seat! After I had satisfied myself that I knew what was going on we headed back into the city centre to browse in the shops and hit the pubs! That evening we went to The Hard Rock Cafe for a meal and Cocktails! Really healthy living for an athlete! On Saturday morning we went to Edinburgh Zoo in the hope of seeing the Panda's, but we hadn't realised that you have to book a Panda time slot and all the slots were booked for that day! We still had a nice time and the sun actually decided to shine on us all day. I think I even made a flippant comment like "If its like this tomorrow it will be too hot to run!". That evening we went to Zizi's Italian restaurant to "carb up" and I enjoyed Chicken Rigatoni with Garlic Bread washed down with a sneaky glass or 2 of red wine! I decided that as my training had gone to pot due to my ankle injury wine wasn't going to make that much difference. After all I wasn't after a PB! Just as we left the restaurant to head back to the hotel the rain started! I thought to myself "better it gets it over with now" and wasn't too worried. I hadn't run for 8 days prior to this race as I wanted my ankle to be well rested so I was a bit apprehensive about my level of fitness especially as I hadn't run more than 10 miles since running the Chester Marathon in October! alarm clock finally rung at 7.15am. I was straight up out of bed, threw back the curtains ... and was dismayed to see the rain pelting it down and the tree's bent double with the wind! I groaned! Oh well lets smile and stay postive, I was here and able to run so I might as well make the best of an awful situation! After forcing down a mug of coffee and an instant porridge pot (I really wasn't hungry) it was time to pack before I got dressed in my running gear and fixed my race number on. It was soon time to layer up before heading out into the wet and windy world! We left it as late as possible before leaving as I really didn't want to be hanging around too long in the awful weather. At this point I did start questioning my sanity! Why would anyone want to run 13.1 hilly miles in wet, cold, windy conditions? We made it to the start just in time for me to have my usual pre-race nervous wee, which was an ordeal in itself! I was convinced the way the porta-loos were swaying that I was going end up with Dorothy in the land of Oz! We then made our way through the wet soggy crowds to find my starting coral. I was in coral 3 and entered the "pen" still layered up. I'm sure all the other runners were thinking "she can't be running like that!" There was no way I was getting stripped off until I HAD to! The start of the race was delayed slightly due to "safety reasons" caused by the weather! which were then passed swiftly over the fence to my husband! By everyone's expressions I think they now thought "Oh she's not so stupid after all!" As the race start was announced the front coral moved off. Coral 2 followed, and then it was time for my coral to walk towards the start line. Before I knew it we were running and I was on my way! Along both sides of the road the crowds were cheering and clapping us as we went past. I soon felt comfortable and settled into my pace. I seemed to be in with a crowd all running my pace so I didn't experience any blockages! The course was fantastic and very scenic. I felt like I was on a sightseeing run! Its a pity it was in such awful weather conditions. We went from Holyrood down to Portobello beach where the weather really turned brutal and at this point I was wondering whether I would make it to the end through such strong gales and torrential rain. However, there was a wow moment (literally only a moment) when the rain subsided and the sun shone and there was a beautiful rainbow in the sky! I so wanted to stop and take a photo, but resisted the urge and kept going. The route then took us back round Arthurs Seat and we were rewarded with some fabulous views as well as some serious hills! At about mile 7 I decided I needed a little extra energy and ate a gel I was carrying with me. We then headed into and around Central Edinburgh and were greeted once again by crowds of spectators. There was a lot of international runners which also meant alot of international spectators who were fabulous! It made me realise how reserved us British are as the "foreigners" really got behind us and put some gusto into there chants, especially the Americans! They really made my day! Especially all the "Good Job!" chants. However, after saying that I did think a little boy and his Mum sitting out in the pouring rain and wind on deckchairs playing "drums" using pans and wooden spoons were fabulous too and really spurred me on! Coming towards the finish the crowd support grew and I was delighted to finally have the finish line in my sight! I had survived ... my ankle had survived! I stopped my Garmin as I went over the finish and it recorded 2:07:40. I was amazed to discover the official time was identical to my Garmin! The first time that has ever happened! 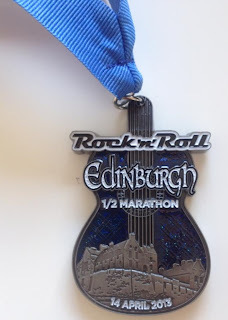 I was pleased with my time considering the course was hilly, the conditions were horrendous and my training had been limited due to my injury. You can view my run here. Once over the finish line I was presented with my well deserved medal (really good chunky heavy bling - the best I have had! ), a banana, crisps, energy bar, water, Haribo's but NO BAG! I instantly had to turn from runner to juggler! We then had to go to the other side of the field to collect our finishers T shirt from a tent! Very strange! Life for everyone would have been so much simpler if everything was in a bag and given to you as one! I managed to lose one of my running gloves. I have no idea where or when as on every photo I can be seen clutching two but once over the line I only had one! You can view my official photo's here. Although be warned I do looked like an escaped psycho on most of them! The headline act at the start and finish was cancelled. I assume this was due to the weather and also there wasn't a band at every mile as advertised which was slightly disappointing and not very Rock N Roll. I was pleased I didn't have luggage to collect as the queues for this were horrendous. One sure way to catch hypothermia is to stand around in the rain and cold after a race for an hour or so waiting for clothes to put on! On a positive note there was plenty of water stations every 3 miles on the route and it was bottled water rather than poxy cups, along with isotonic drinks stations too. If I was being picky I would prefer water in bottles with sports tops rather than screw tops so I could run with my bottle. The traffic management seemed to work well, at least for us runners! I'm not sure the people stuck in the traffic jams felt the same way especially when one bloke shouted out his window as I went past "I'm bloody stuck here just cos you idiots want to run!". Timing mats at 10k and 10 miles were a welcome addition too, as I am a bit of a statistics geek! 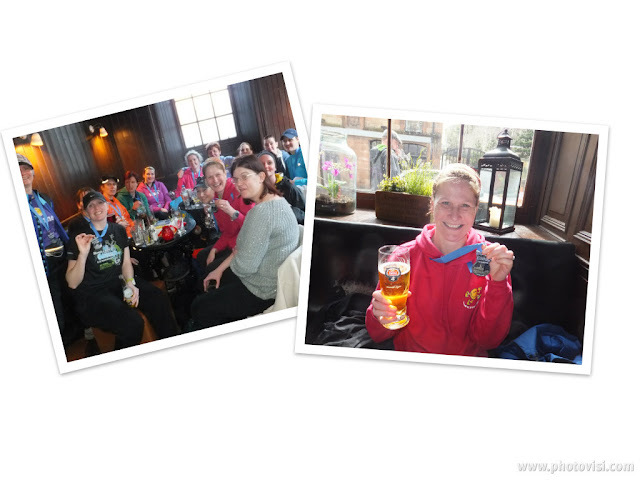 After the race I met some running friends at the actual finish line in the cold but then we all went in a local pub for lunch and a drink which was a lovely way to end a hard run! However, I was slightly dismayed to discover when I arrived in the pub at 12.10 that pubs in Scotland on a Sunday can't serve alcohol until 12.30! I had to be satisfied with a coke for 20 minutes! This race will probably rank as my hardest so far but this was mainly due to the weather conditions as well as my injury! I didn't think about my ankle whilst running and I wasn't in pain (I think the natural endorphins must have kicked in) but afterwards my ankle did make its unhappiness known to me. I am now on day 2 post race and I'm still taking ibroprofen and icing regularly. I hope it forgives me soon! 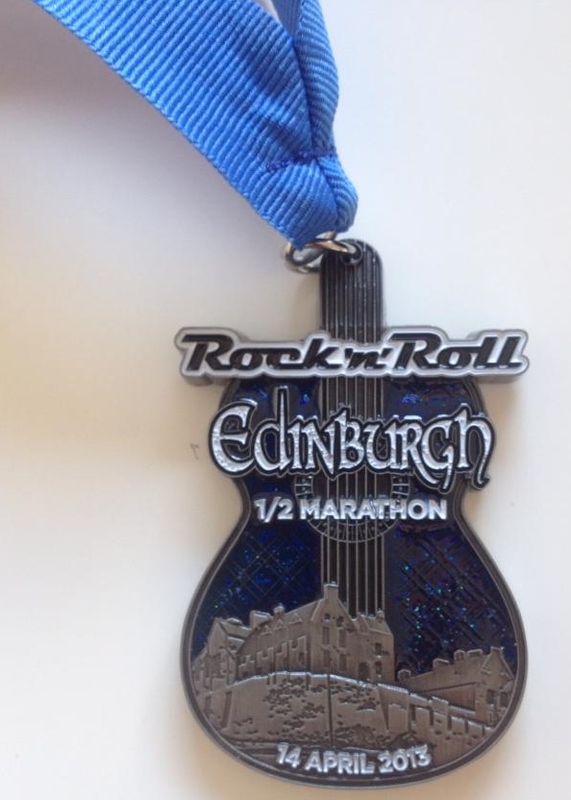 I will definitely return to Edinburgh in the future to Rock N Roll again in better conditions!